October is turning out to be one of the best months for fishing that I have seen in a while. There are tons of white bait around, and the fishing has been on fire! Today, when we left my dock in Everglades City, We headed down toward the Houston River, where the snook and red fishing has been excellent . It didn’t take long after anchoring up the boat, for the fish to start biting. 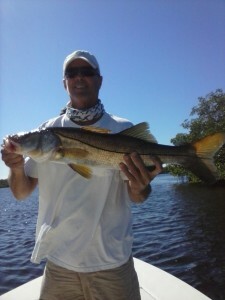 Within minutes of casting out a live bait, we were hooked up with a snook in the 10 lb range! After catching several more nice sized snook, with a few big redfish mix in, we decided to head a mile offshore to fish a wreck, where the mackerel have been schooled up. When we arrived offshore, the mackerel were everywhere. We saw the mackerel were crashing bait on the surface, so we decided to cast out a gold spoon for bait, that mackerel can’t resist. Right away we were into some solid, nonstop, action! We caught plenty of mackerel weighing up to 5 lbs. Don’t miss out on some great fishing action! Give me a call, and let me get you out on the water for a great day of fishing!